← March 3, 2013 – Knee Schmee, Let’s Ski!! While the Pacific Seacraft was undoubtedly a quality boat, we were still struggling to justify the price. It was going to require some serious penny-pinching for us just to get the boat and another disheartening sum to get it in cruising condition. Instead of “Yes, I’ll have the veal scallopini, please,” we were going to be that embarrassing couple that brings their own PB&Js to the restaurant and then cleans out the table condiments and the mint bowl on the way out. You really don’t get invited back much after a scene like that plays out, trust me. So, after some thought and a smart nudge from our broker (thanks Kevin! ), we decided to take a look at some “Toyotas,” i.e., older, more affordable boats that boasted the same cruising capability for half the price. 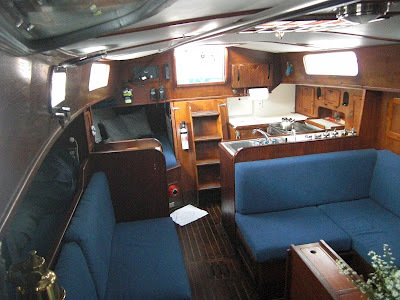 One of the first boats that fit this bill was a Morgan 382 that had just come in from a circumnavigation. Yes, that means exactly what you think it means. All the way around the world. Not only is that just awesome. Period. But the fact that the boat had been used, really used, and had proven itself, was definitely a confidence-builder, and it was priced well. But, others had the same idea and were chomping at the bit to see this boat too, so we had to move quick. Luckily, Phillip already had a trip on the books down to Panama City where they were docked so he squeezed in a detour to the marina to check it out. Sadly, though, it had two major downfalls. The cockpit benches were cut out on each side to allow maneuverability around the massive (a.k.a. big, honking) steering wheel. Meaning, you could not stretch out in the cockpit. This was a deal-breaker for us. As Phillip explained it to me: “The cockpit is like your living room. It’s where you’ll spend most of your time. It’s got to be comfortable.” So, the T-shape cutout in the cockpit was a big downer, but that wasn’t the only thing. Phillip also found, while it was beautiful, the galley and salon felt tight and cramped, even for a 38-foot boat. Like I said in the beginning, you just know when you step on the boat, and Phillip knew when he stepped on this one that it wasn’t right for us. So, the Morgan was a no-go. 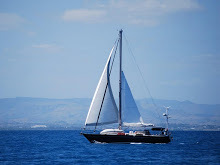 But, to optimize Phillip’s time in PC, our trusty broker had lined up a viewing for him of a Tayana 37 that had already sold but was still in the marina and available for some good poking around. Tayanas are built in Taiwan and are hand-crafted, each one of them, which makes each one unique, and the woodwork is exquisite. Think carvings and shapings worthy of an old Spanish chapel. They’re also sturdy as hell. It’s like a tank … on the water … with sails on it. Phillip really liked the build of the Tayanas so we decided to add them to the list. In all, we knew we were pleased with the quality and performance of the older boats, not to mention the affordability, so a Toyota it was going to be. We were now squarely on the hunt for a good ‘ole (emphasis on ‘ole) boat! 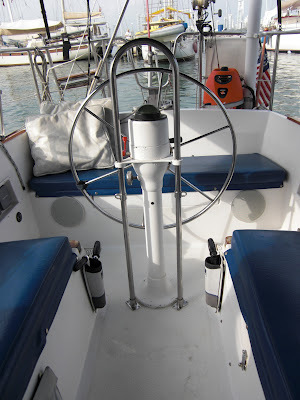 This entry was posted in Boat Shopping and tagged morgan 382, Pacific Seacraft, panama city, tayana, tayana 37, tee cockpit. Bookmark the permalink. I can’t wait to see where this amazing adventure takes you!